Landing in Dublin, in a cab to the hotel, the Irish taxi driver (a man from Meath), instantly and genuinely congratulated my husband and me for our President’s honor. Our taxi driver also quickly pointed out that President Obama was “a native son,” being part Irish on his mother’s side a few generations back. 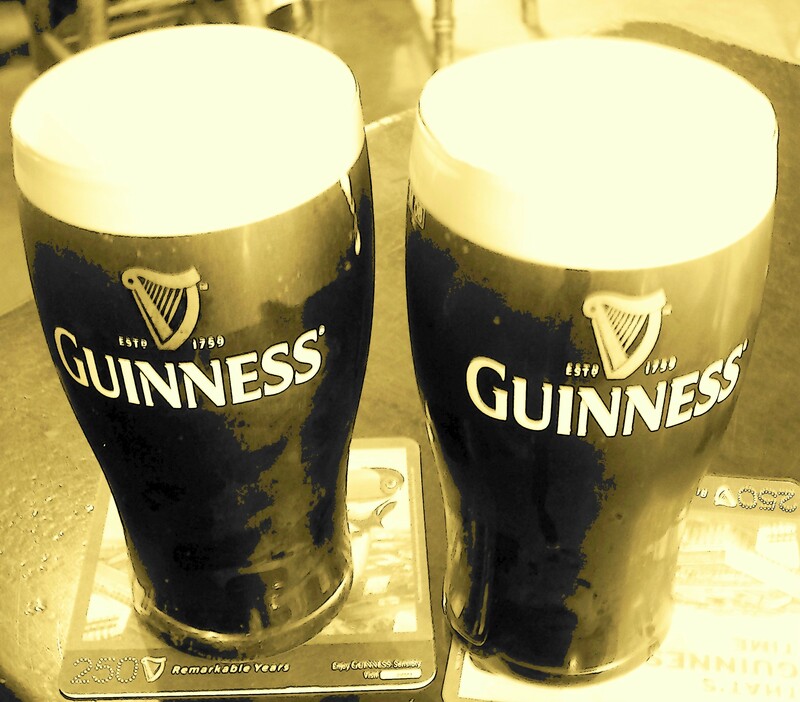 Indeed, fast-forwarding to 2011, President Obama tipped a pint of Guinness in the village of his ancestors, aptly observing that they keep the best Guinness in Ireland. In every village he visited and in Dublin’s fair city, the throngs who came to cheer on the President definitely showcased Ireland’s love for President Obama. To think that President Obama is so proudly embraced by normal Irish folks– when a vocal weirdo contingent in the President’s own country absurdly believe he’s not even born there, and when the President’s own American supporters couldn’t even congratulate the man for receiving an amazing honor– well, that’s why I love Ireland. You don’t have to win the Nobel Prize or be the Leader of the Free World to experience Ireland’s embrace, however. You just need to spend as much time as possible in pubs. Listen to music. Talk to folks. Swap stories. And, of course, drink pints. Lots and lots of pints. There should be some history or story attached to the pub, one that the barmen and regulars like telling. There should be regulars who frequent the pub, not just tourists. There should be at least one regular who had his/her first drink at the pub, or who has been drinking there for over a decade. There should be woodwork. Real wood bars, floors, wall panels, etc. All contribute to an atmosphere of requisite coziness. The pub should not be brightly lit, and should definitely not have those halogen lights that blind you when you look at them and burn your head and/or ears if you’re too tall. If the pub does food, it should not be the pub’s focal point. Rather, the menu should list a few tasty items (soup and brown bread, stew, etc.) to help absorb the pints you’ll have. There should be a minimum of those annoying game machines that light up and cling-clang constantly. Not a one is vastly preferable, however. Last, but certainly not least, the Guinness should be poured well. The other tap libations should taste like the lines are clean. The Long Hall Bar, 31 S. Great George’s St.
A Victorian treasure, this pub will take you back to a time when gents drank their pints while wearing top hats. With a beautiful long bar and lots of gleaming brass, this may be the classiest historic place to down a few. Toner’s, 2 Upper Baggot St. This is a fantastic traditional pub, which Yeats reportedly frequented. The poetry continues; I was taught to hurl the very poetic “toe-rag” as an epithet by a very funny man named Sean late one evening. Should you ever find yourself leading the free world and winning a Nobel Prize without getting any appreciation from your countrymen for it, take solace. Someone in Ireland claims you as Irish and toasts your success, embracing you as a native son. If your life’s pursuits are less lofty, the welcome you’ll receive in a Dublin pub (after a few shared pints, of course) will be no less. I am not sure that you would even remember me – I was the A/P Sup at Esurance – but I have read a few of these blogs of yours and just had to say I like how you put a point on your discussions. It is nice to hear an agreement with this point of view rather than an argument against everything that sounds like a positive step for our politics. You are a gem. Take care – and enjoy yourself all the time. Hi Ken! Of course I remember you. I’m so glad to hear from you. Thanks so much for the kind words. Positive’s so much better than all the negative mojo out there. There’s too much good stuff to get caught up in all the bad. I’ve had a pretty good record for enjoyment since September, as I went on a trip around the world with my awesome hubby. We just got finished the circle in May. On the road, my blog languished a bit, but all the great experiences gave me loads of good material for future posts. I hope you’re well. Thanks again for getting in touch.